An Interim Secretariat made up of “16 full-time civil servants” will fill the environmental governance gap in the event of a no deal Brexit, a situation Environment Secretary Michael Gove has described as “sub-optimal”. Gove, along with Resources Minister Therese Coffey, was giving evidence on behalf of the Department for Environment, Food and Rural Affairs (Defra) to Parliament’s Environmental Audit Committee (EAC), which provides scrutiny of the environmental impact of government policy. 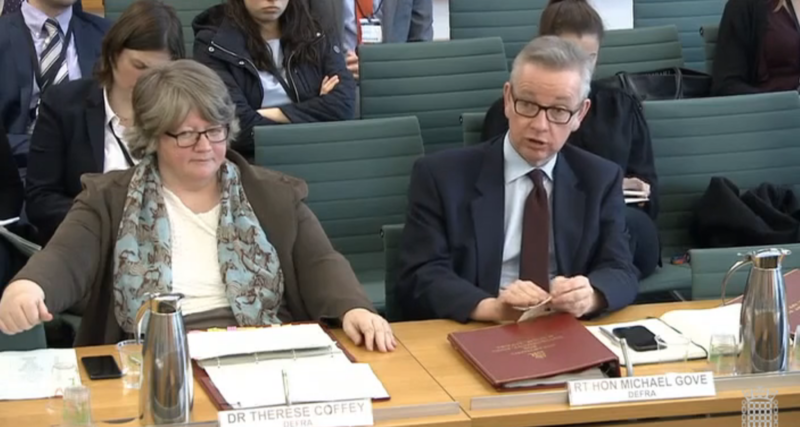 Therese Coffey (L) and Michael Gove (R) giving evidence to the EAC. The EAC has been conducting an inquiry into the draft Environment (Principles and Governance) Bill, which was published on 19 December 2019. The bill was put forward following a public consultation and lays the framework for a new Act of Parliament to transpose existing EU environmental law into UK law, and to define and create the structure of governance that will ensure environmental standards are maintained post-Brexit. How might a new enforcement body look? As the UK leaves the EU, it will cease to come under the jurisdiction of the European Commission and European Court of Justice (ECJ) and will have to replace these structures to ensure that environmental law is followed and enforced. To replace this governance structure, the establishment of an independent Office for Environmental Protection (OEP) has been proposed, which would have powers of enforcement and be able to hold the government to account over its stated environmental principles and policies. This was recommended by the EAC in a previous inquiry into the government’s 25 Year Environment Plan (25YEP). According to Gove in his responses to questioning from the EAC, such a body would have a budget in the “millions” of pounds and the Chair and board of the OEP would have “all the resources they need” in order to provide adequate scrutiny and to take up complaints and judicial action against the government if necessary. Gove stated that the OEP would be established before the end of the agreed Brexit transition period – though this is dependent on a withdrawal agreement being ratified – at the end of 2020. Gove continued that the OEP would be able to “exercise full independence as a non-departmental public body” – this in response to EAC Chair Mary Creagh’s accusation that Gove had ignored the advice of the EAC to make OEP accountable to Parliament – and that it would be staffed by between 60 and 120 people. The European Commission’s Directorate-General for Environment, which is currently responsible for scrutinising environmental policy, currently has around 500 members of staff. However, in the event of a ‘no deal’ exit from the EU – which remains firmly on the table – the UK’s environmental governance would be maintained by an Interim Secretariat, according to Coffey, until the OEP could be established. This would be staffed by “16 full-time civil servants” from Defra and other departments. When Creagh put it to the two ministers that such a body would be inadequate and fall short of providing the governance currently provided by the Commission and the ECJ, Gove admitted that it was a “sub-optimal solution”. This is not the first time Gove has been questioned by the EAC on a potential policy gap in the event of a ‘no deal’ Brexit. Back in July 2018, as part of the EAC’s inquiry into the 25YEP, he refused to guarantee outright that environmental standards would not fall after Brexit, leading Creagh to remark that Gove was “papering over the cracks”, and hardly reassuring the EAC when he stated that work was being carried out to ensure there is “no or at the very least a minimal air gap” in environmental governance once the UK leaves the EU. The risks posed by ‘no deal’ remain significant. Greener UK, a coalition of 13 major environmental organisations co-ordinated by think tank Green Alliance, recently warned that all areas of environmental policy and protections are at high risk of being weakened or negatively affected in the event of a ‘no deal’ Brexit in its latest Brexit Risk Tracker update. One area that a ‘no deal’ would particularly affect is the shipment of waste between the UK and the EU. The UK currently exports around 3.6 million tonnes of refuse derived fuel (RDF) to Europe every year, which could be disrupted in the event of queues at ports and a change in regulatory alignment. Though Gove admitted in a letter to Lord Teverson, Chair of the European Union Energy and Environment Sub-Committee in the House of Lords, that provisions were being made for the stockpiling of waste in the event of a ‘no deal’ withdrawal, Defra has confirmed that 100 per cent of the UK’s existing notified waste shipments to the EU will be maintained. MPs in the Environmental Audit Committee say the oversight body should have legal powers to hold the government to account on the goals set out in its 25 Year Environment Plan. Environment Secretary Michael Gove has been accused of “papering over the cracks” by MPs in Parliament’s Environmental Audit Committee during an evidence session on the proposed Environmental Principles and Governance after EU Exit Bill. The government has warned waste exporters to expect delays at container ports such as the Port of Dover in the event that the UK leaves the EU without a deal, and says businesses should seek ‘alternative’ export, recovery or disposal routes for their waste. The Environment Secretary Michael Gove has outlined Defra’s preparations for the stockpiling of waste in the event of a ‘no deal’ Brexit in a letter to Lord Teverson, Chair of the European Union Energy and Environment Sub-Committee in the House of Lords.